Go off road - onto the carpet, couch, bedroom, backyard - these Krazy Kars Hummers can go anywhere! 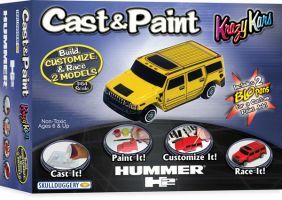 This kit lets you make your own Hummers, then give them a completely custom paint job. Try flames, or stripes - or even paint yourself in the driver's seat! Contains enough supplies to make two GM Hummer H2 models! Once they're ready, race them on any matchbox sized track!